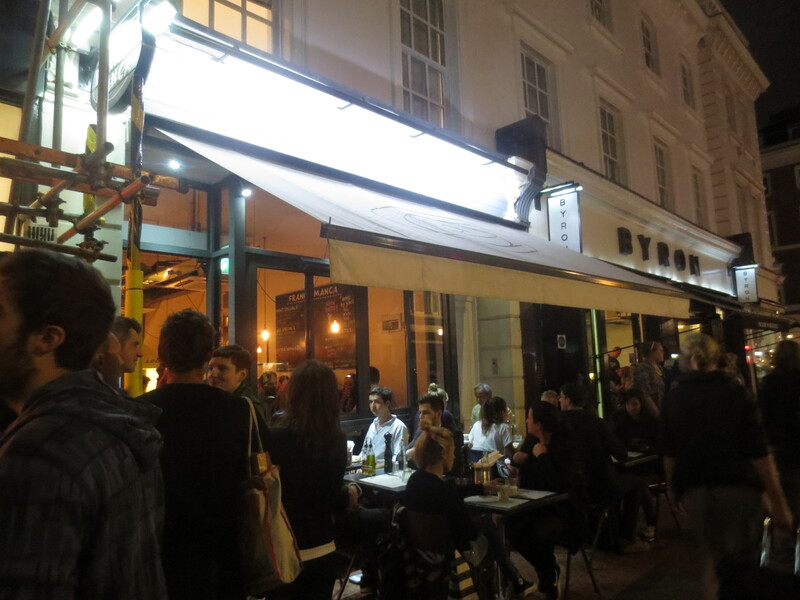 There’s been a wonderful Italian food revolution in London over recent years. Of course, Italian food has been available for a long time, especially since the immigration of Italians to London in the late 19th century, in particular to Clerkenwell and spreading across to Soho, bringing real Italian food with them. I’m old enough to remember the arrival of Pizza Express, first opened by Peter Boizot in 1965 and how exciting that was, and it remained a favourite for a long time. But to find a good Italian deli, you probably had to go into London’s Soho. Now though, excellent Italian delis, pizzerias, gelaterias and restaurants are popping up everywhere. And the quality is exceptionally high. There is no longer the great divide between the Italian food you eat in Italy and that found in London. Here, we now have great Italian food. For instance, just a 10-minute walk down the road there is my favourite local deli, Corto Italian Deli, which sell cheeses, meats and other Italian foods of the highest quality. I’ve talked of how we no longer have to fly to Italy to experience the glory of a good gelato. We have the wonderful Gelupo and Gelateria Danieli. And of course I’ve talked many times about the fabulous sourdough pizza at the brilliant Ruben’s Refettorio – also about a 10-minute walk from my home. If you’re thinking I seem to have a lot of good Italian places to eat within walking distance – I do! I’ve even written about it here: Twickenham’s Little Italy. The proximity of Ruben’s to my home is in a large part responsible for my failure to get to Franco Manca earlier than last night. I’d been hearing great things about it for ages. It’s been hailed the best pizzeria in London by Time Out; Italians friends have told me how good it is. There’s a branch in Chiswick, not too far away from me, but a car or bus journey as opposed to the leisurely short walk I take to Ruben’s. 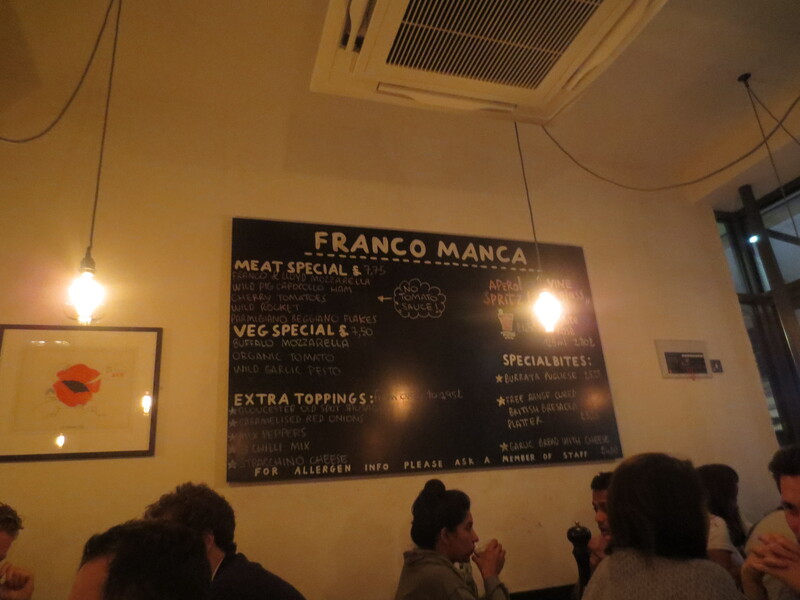 My lovely friend Lucia was keen for me to try Franco Manca out and so invited me to join her and a friend last night. We met at the Victoria & Albert Museum to see an exhibition on shoes (a bit disappointing), and from there it was a short walk to the Old Brompton Road and South Kensington branch of Franco Manca. It was nearly 8.00pm and we were hungry. As we approached we saw the long queue. You can’t book. We were told there’d be a wait of about 20 minutes (in fact it was 35 minutes), but so keen were we to eat there, we were happy to wait. It had been a gloriously sunny day in London and the air was still warm enough for us to be comfortable waiting outside. It was all well organised. Someone took names and asked if we wanted drinks while we waited. Once inside it had the air of informality you expect from a pizzeria – scrubbed wooden tables and benches, some walls of exposed brick while others were simply painted white. There was a lively buzz and it felt like a great place to be. The menu is simple: 6 pizzas to choose from and numbered, not named, plus a couple of specials. There are extra toppings you can choose to add; a choice of just one mixed leaf salad to accompany. This, of course, makes it all the more like Italy. The Italians keep their pizza simple; there’s never a long menu. I was pleased to see that No.1 was by any other name that iconic Marinara Pizza, the most classic pizza you might choose in Naples with a simple topping of just tomato, garlic and oregano. However, I thought I’d be a little more ambitious in my topping than that and went for No.4: Gloucester Old Spot Ham (home cured), Buffalo Ricotta, Wild Mushrooms and a little Tomato. If ‘Gloucester Old Spot Ham’ doesn’t sound very Italian, that’s because Franco Manca like to source locally as much as possible. They choose rare breed pork for its flavour while an Italian cheese maker, Albino Scalzitti, was brought over from southern Italy to Somerset when the first Franco Manca opened in Brixton in 2008, to produce mozzarella daily for them. Other cheeses come from Neal’s Yard; their chorizo from Spain. 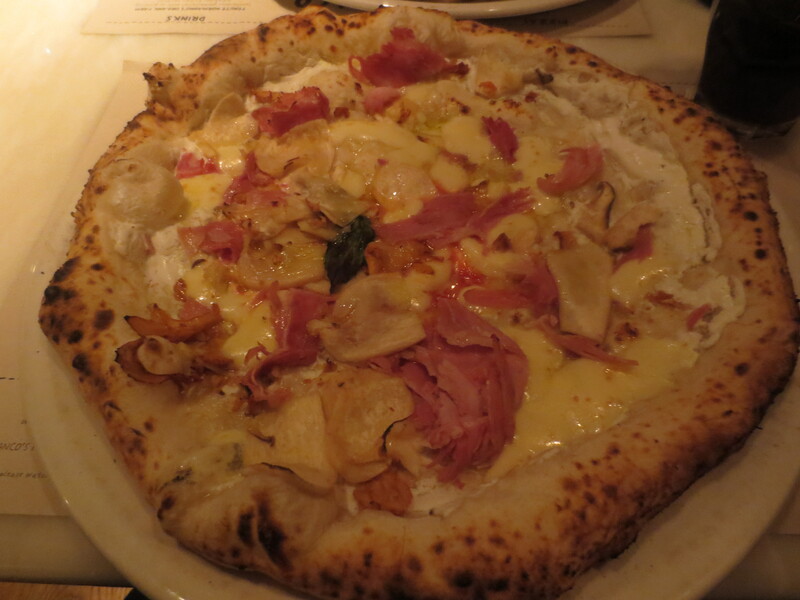 If the ham is English, the pizza is very much Italian; it’s also a Neopolitan type of pizza with its soft crust. This is the type of pizza you find in Naples, but the added bonus at Franco Manca is the gloriously tasty sourdough which is risen slowly for the best soft texture. 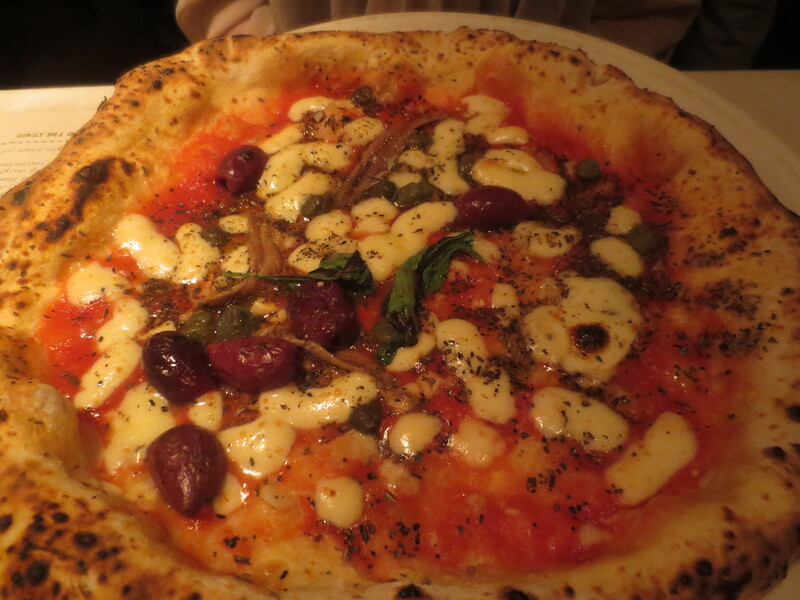 Lucia chose No.5 with Garlic, Oregano, Capers, Olives, Anchovies and Mozzarella. The pizzas were as good as I’d been promised; really wonderful and I was particularly impressed by the quality of the toppings, showing the care and attention that Franco Manca give to ensuring the best quality for every part of the pizza making. Also impressive are the prices: they are fantastically reasonable by London standards (more akin to what you might pay in Italy!). My pizza was just £6.85. There are 10 Franco Manca restaurants across London but in March they were bought for £27.5 million by Fulham Shore company, which owns number of restaurant chains. With their ambitions to grow Franco Manca one can only hope that it doesn’t lose its authenticity and the high quality of ingredients and preparation that make it so special now.